We asked you to draw your dream subway map, and you responded in droves. In August and September thousands of you drew maps for the Subway Vision project to let us know where you thought future subways should be built in San Francisco. At pop up workshops and online, more than 2,600 unique ideas were submitted through our online mapping tool. The project team has already started looking at how the subway lines you drew can form larger networks and fit into the city's larger transportation plans. The heat map of your online responses. San Francisco is growing at a pace not seen in decades. To ensure our city remains vibrant and livable, under the direction of Mayor Ed Lee, the SFMTA, the Planning Department and the San Francisco County Transportation Authority have been working hard to make sure our transportation system keeps pace. The Subway Vision is just one piece of a new effort to create a broad, long-range plan for all aspects of transportation called Connect SF, which is meant to lay the foundation for an effective, equitable and sustainable transportation network for the city’s future. We’ve done a lot already. The Central Subway tunnels are dug and stations are under construction. We’re replacing the entire Muni bus fleet, and new trains are on the way. We’re creating a Muni Rapid network, and we’re about to break ground on the city’s first bus rapid network on Van Ness Avenue. We’ve also built 30 miles of protected or buffered bike lanes in the last five years, and we’re requiring new building developments to contribute more funds to help address the increased transportation demand. Connect SF is a collaboration with agencies from around the region as well as from within the city to provide the coordination needed to build the right transportation network for San Francisco in the decades to come. Building and managing complex transportation systems requires carefully coordinated planning many years in advance. The more we learn about the priorities, concerns and challenges of today’s San Franciscans, the better we can prepare for our future. The input from the thousands of suggestions you provided will help identify many of those priorities, concerns and challenges. 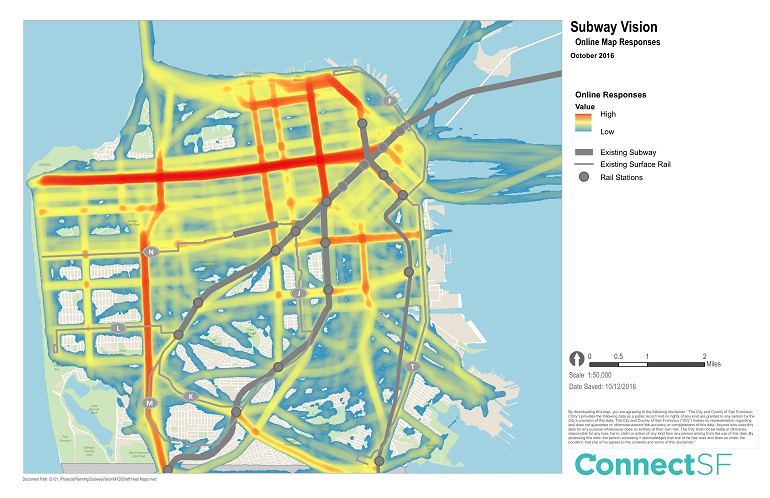 They have been organized into areas throughout the city (shown in the maps below) that will be studied as part of the Subway Vision and larger Connect SF planning efforts. The areas for further study underscore the desire for more transit choices citywide. Transportation decisions affect our lives every day, whether we walk, drive, carpool, car-share, bike or take transit. The decisions we make today will have lasting effects for generations to come. This is our chance to set priorities together, to meet community aspirations, to help get projects built faster and to secure more funding from regional, state and federal sources. To see all of the subway ideas submitted check out ConnectSF.org for an interactive map. You can help spread the word and let people know that you are excited for the future of transportation in San Francisco by sharing the Subway Vision map page and details on social media using the hashtag #ConnectSF.